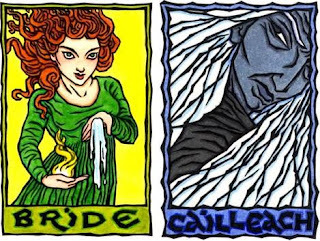 As it’s almost Imbolc the story of Bride and Cailleach has been on my mind the last few days. Cailleach and Bride’s interactions with mythology are all about transformation. Cailleach is arguably one of the most ancient Goddesses of the Celts. In fact she may even be a pre-Celtic Goddess, possibly being an earth Goddess of the original inhabitants of Ireland, prior to their integration with the invading Celtic tribes. She is usually described as an old woman with white hair and blue skin and at times is thought to be a giantess, dropping boulders out of her apron as she walked along. She was associated with Slieve na Calliagh, a peak of jagged rocks situated in a low range of hills in Ireland, which is made up of jagged rocks, which may be why she was sometime said to have very sharp teeth. Cailleach is best known as a Goddess of cold, winter, and darkness. She was also a Goddess of storms and during the winter months she was said to ride through the air on the back of a wolf, bringing snow and ice to the world below. According to my Irish grandmother thunder is really the Cailleach sneezing! She also had a magick wand that she used to strike away any hints of green on the winter landscape. As the winter hag Cailleach kept spring at bay, usually by keeping Bride, who represented spring hidden away. In Scotland it was believed that each year Cailleach held Bride captive in a cave. Unfortunately for Cailleach her son falls in love with Bride and together they flee the cave. Enraged Cailleach chases the lovers, conjuring up storms in her wake, but with the release of Bride spring soon overtake winter despite Cailleach’s best efforts. In other versions Cailleach turns to stone at the first signs of spring, and Bride escapes bringing with her renewed fertility and warmth to the world. But at Samhain Cailleach awakes again and captures Bride and once more holds her captive through the winter. In another version Cailleach travels to a magickal isle (sometimes said to be the Isle of Skye) where there is a miraculous Well of Youth. On Imbolc she drinks from the well and transforms into Bride. There are so many layers to this simple story. On one hand it is a seasonal myth. In other cultures many Goddesses connected to the sun are often hidden away in caves during the winter and return to the world with spring, Bride’s imprisonment in the cave mirrors this. But we can also see this struggle between the hag and maiden, winter and spring within ourselves. At times we keep our inner fire banked, we burry our creativity, our passion our hope deep within, like Bride in her cave. And like Cailleach sometimes we are afraid to let that part of ourselves out. We resist change. During this time of year I think about what I have been keeping locked away within me. Have I banked my inner fires? Have I been afraid to welcome change in my life? And I think of the winter hag taking a drink from that sacred well, willingly accepting change, knowing soon she will be the Goddess of spring. Brew a cup of your favorite tea or if you prefer use wine. Take the cup to your sacred space. Place two candles on your altar, one of each side. Blue for Cailleach and a red candle for Bride. Light the candles and place your cup in-between the two candles on the altar. Take a few minutes to ground and center. See yourself in a small boat. The boat glides soundlessly across the waves, and a cold winter wind blows across you. Soon your boat glides up to the isle’s shore and you step onto the green earth. Shaded by a grove of trees you see an old stone well. The well waters shine with their own light, and you know you have found the Well of Youth. Take a few minutes to consider what kind of transformation you wish to bring into your life. Are their old habits that you need to shed, new ventures you wish to start? When you are ready you dip your hands into the water and drink. Renewed and transformed by the Goddess! Matchmaking in Dheevara matrimonial sites like Matchfinder is pretty simple. Register now.